These are some of the only true lofts in the Buckhead area. Features include exposed brick and ductwork, high ceilings, and arched windows. The building features a 24 hour concierge, hot tub, cooking area, dog friendly dog run, and covered assigned parking. 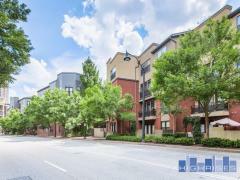 Buckhead Village is proof that exposed brick doesn't have to mean old construction. These units take advantage of the lofty design aesthetic while offering modern amenities in a desirable location. Have any comments or questions about Buckhead Village Lofts? Ask your question and/or share your thoughts about this Building.